Angela Davis delivers the lecture “Enclosures: Quotidian Carceralities in the US and Occupied Palestine," November 20, 2014, Wood Auditorium, Columbia University. Kazuyo Sejima discusses the work of SANAA, September 17, 2014, Wood Auditorium, Columbia University. Laura Kurgan, Kate Orff, and Naomi Klein discuss planning for climate change, September 24, 2014, Wood Auditorium, Columbia University. Naomi Klein signs copies of This Changes Everything: Capitalism vs. The Climate and Kate Orff signs copies of Petrochemical America, September 24, 2014, Columbia University. 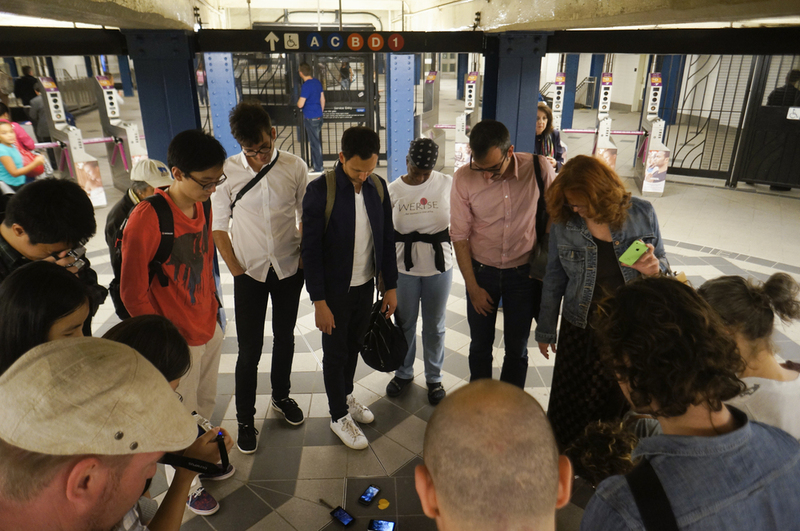 Mandala: Reimagining Columbus Circle, a participatory walk devised and led by Karen Finley. Photo by Justin Liu. Scaffold, Billboard, Fountain, Sundial, Ledge. Taking cue from William H. Whyte's famed study of the plaza of the Seagram Building, the object-oriented 2014–15 Core Series of events at Columbia University GSAPP creates a new public space for conversation and exchange. Built with words in real time over the course of the year, speakers from five continents explore urgent questions at the intersection of design and law, science, social and economic justice, artistic practice, cultural theory, and more. Office workers sunbathing on ledges, “watchers” leering at passersby from stairs and standpipes, commuters fashioning ad hoc desks from trash can lids, tourists tying shoelaces on fire hydrants: Whyte and his team found that people use space in unexpected ways. Physical objects make public space habitable and facilitate civic exchanges and daily dramas, and those listed on the 2014–15 Core Series poster designed by MTWTF are the infrastructure and prompts for untold conversations to come. "What attracts people most" to a place, Whyte contends, "is other people."